Pictures provided by Shawna Weland. For more photos, click on the image. 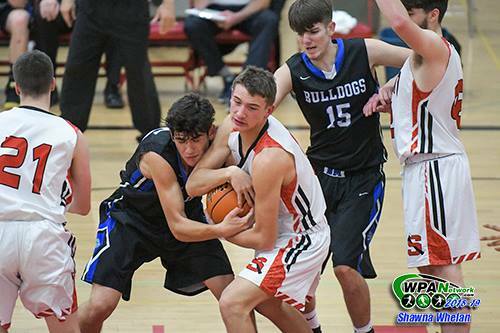 The Shelton boys basketball team was too much for North Mason Friday night as the Highclimbers jumped out to a 15-point first quarter lead on the way to a 64 to 48 win over the Bulldogs. 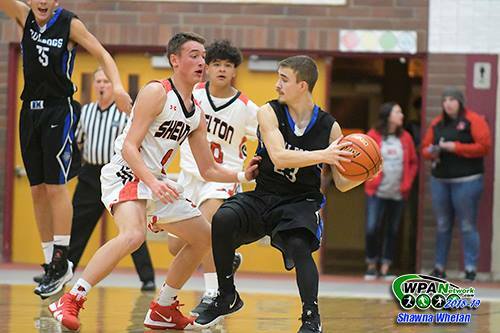 North Mason did rally in the second quarter and pulled within six points but Shelton pulled away again in the third quarter increasing their lead to 24 points. The Bulldogs made a run in the fourth quarter and outscored the Highclimbers 17 to 8 but couldn’t overcome the deficit. ‘Climbers’ Noah Benson (#21) drives by Bulldogs’ Miller Campbell (#10). Click the image for more photos by Shawna Weland. Shelton was led by Ty Thompson’s 13 points. Zack Jonker added 12 points – 8 in the third quarter. Kyler Gall chipped in 10 points hitting three three-pointers. North Mason’s John Beattie led all scorers with 15 points. NM’s Brice Solis (#23) defended by SHS’s Zach Jonker (#0). Click the image for more photos by Shawna Weland. The Highclimbers improve to 2-and-0 on the season. The Bulldogs drop to 1-and-2. 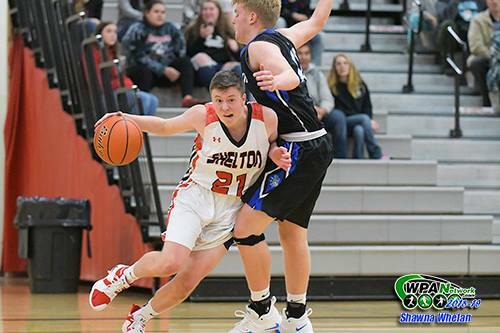 Shelton opens South Sound Conference play Wednesday when they host Peninsula. MasonWebTV Powered by HCC will broadcast the game between the ‘Climbers and the Seahawks. North Mason travels to Crosspoint Saturday. The North Mason girls’ basketball team is 3-and-0 on the season slipping by Shelton Friday 68 to 65. The Lady Bulldogs travel to Crosspoint Saturday while the Lady Highclimbers open South Sound Conference play next Thursday at Peninsula. The Mary M. Knight girls’ basketball team knocked off Rainier Christian Friday 51 to 44. The Lady Owls improve to 2-and-0 on the season after beating Quilcene Wednesday 49 to 16. The girls from Matlock host Three Rivers Christian Tuesday.